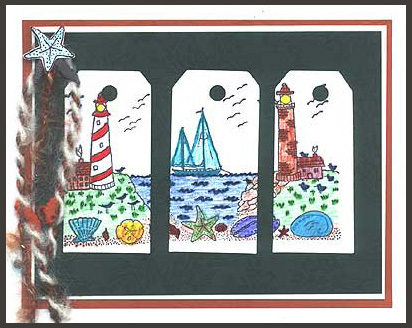 “Sailing with Border” is stamped on white card stock with black ink, colored with oil color pencils and cut into three tags. Holes were punched in the tags. A hole was punched in the dark green background paper and three strands of fibers were threaded through the hole and secured on the back side with Aileen’s Thick Designer Tacky Glue. “Starfish #1” was stamped in black, colored, cut out and mounted over 3 strands of fibers in the upper left corner. The tags are glued to hunter green card stock This was layered on white and rust card stock to form a frame. 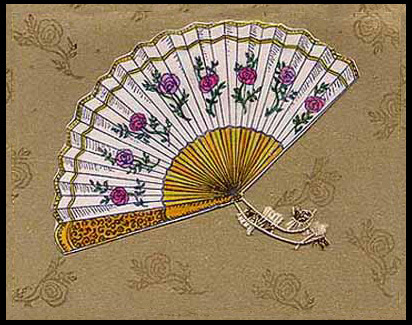 Card by Davetta Alexander. 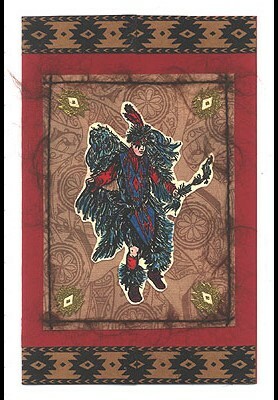 “Native American Dancer #1” is embossed in black on white card stock, colored with markers and cut out leaving some of the white as background. 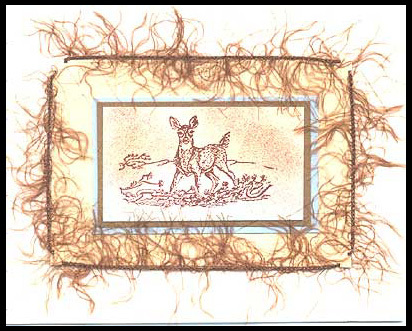 Background card stock is created by repeatedly and randomly stamping “Zuni Pot, Lg.” on tan card stock using a Versamark pad and rubbing on a couple of colors of Pearl Ex. Fiber is stretched to form a border by attaching it to notches in each corner. The notches are made using a corner punch. Four of the Navajo designs are cut from gold embossed on white card stock and placed in the corners. This is layered on maroon card stock which has been bordered with “Southwest Border” embossed in black on tan card stock. Card by Davetta Alexander. Tags: Corner Punch, Davetta Alexander, Embossed, Fibers, Markers, Native American Dancer #1, Pearl Ex, Southwest Design, Zuni Pot Lg.